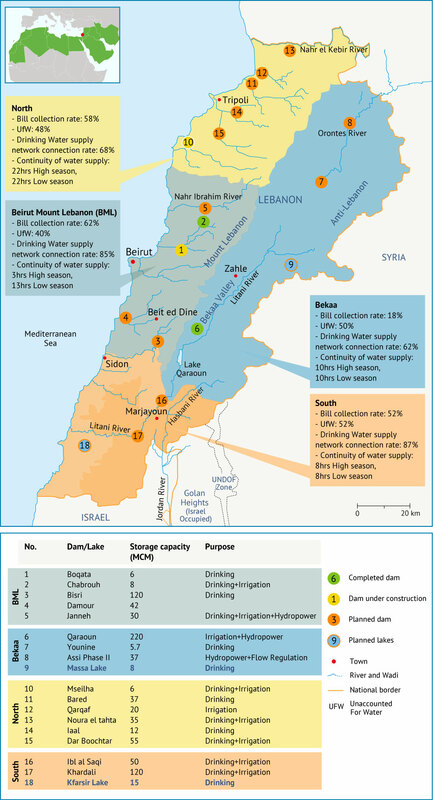 Lebanon’s surface water storage is currently mainly concentrated in two reservoir dams. Built in the 1950s on the Litani River, the Qaraoun reservoir has a storage capacity of 220 MCM/yr and provides around 30 MCM/yr of water for irrigation. The remainder is used for hydropower generation. The Chabrouh Dam (8 MCM) was completed in 2007 and has helped address the chronic water shortage in the Kesrouan region, providing 60,000 m³/day of drinking water. Other small dams on the Damour, Abu Ali, Awali, El Bared and Nahr Ibrahim rivers regulate flows and generate a total of about 270 MW of hydropower. Artificial ponds and hill lakes, especially common in the mountains to capture snowmelt, are used to irrigate crops when the natural flow of streams is insufficient to meet crop demand. Water supply network coverage in Lebanon ranges between 62% and 87%, depending on the region (Fig. 5). However, as many of the pipelines are old and badly maintained, up to 50% of the water supply is lost through leakage and the water supply is often cut. In the absence of an effective public water supply system, most households rely on private water suppliers (see ‘Water Use’). 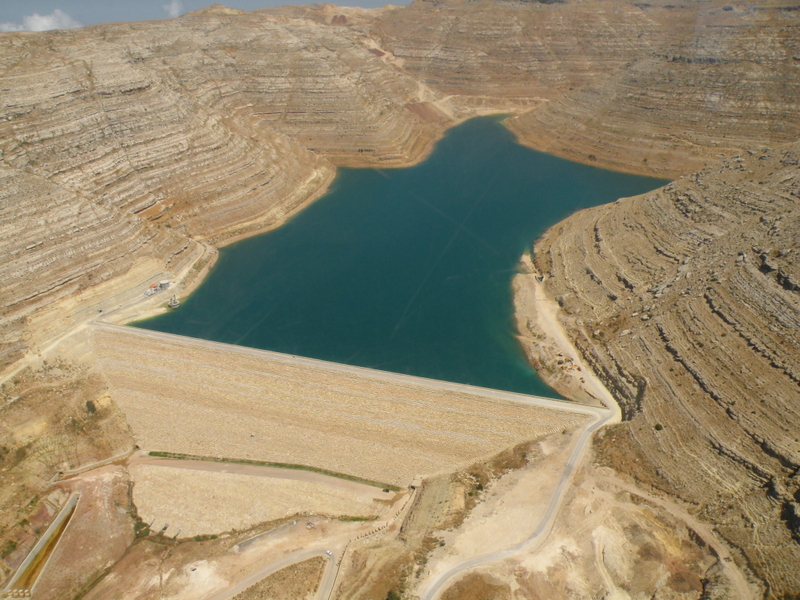 The Ministry of Energy and Water plans to build a number of dams and hill lakes by 2018 (Fig. 6) to address the water deficit. The projects, which are to be financed from local and foreign sources, would supply a total of around 660 MCM/yr of water. However, progress on the different projects is slow due to political and financial constraints. Four dams and a rehabilitation project at Kouachra Lake are currently under construction. Some of the projects are controversial, such as the Brissa Dam in the north, which, after 12 years of construction, started showing signs of leakages in 2013 and is no longer functional. In other cases, such as that of the Qaysamani and Janneh Dams in Mount Lebanon, local communities voiced fierce opposition and managed to postpone the start of construction indefinitely. Elsewhere, the Bisri Dam and the Awali-Beirut conveyance project are designed to meet the water supply needs of the Greater Beirut area, with completion expected in 2018. The Awali-Beirut Conveyor will transfer 250,000 m3/day of water from the Awali River in the south to Beirut during the dry summer months. In the long term, the conveyor will also transport an additional 500,000 m3/day from the planned Bisri Dam on the Awali River. There are also plans to rehabilitate networks and pumping stations and several agricultural schemes and related infrastructure. The average national rate of wastewater collection and treatment is currently estimated at 60% and 8% respectively. The 40% not connected to sewerage networks either use cesspools and septic tanks or simply release raw sewage directly into rivers and streams or dry riverbeds. Around 40 wastewater treatment plants are in various stages of completion across the country. Eighteen of these have been completed; the remainder is under construction or still at the design stage. However, very few plants are fully operational due to delays in the construction of sewerage mains, administrative delays and lack of clarity regarding responsibilities for construction and operation. Thus, the stations at Ghadir (serving the southern suburbs of Beirut and surroundings), Tripoli and Saida are limited to primary treatment at this stage, with the effluents released into the Mediterranean Sea through outfalls. According to the Council for Development and Reconstruction, which is the main authority in this sector, the planned treatment plants should be completed by 2018. Once the plants are fully operational, an estimated 360 MCM/yr (or 80%) of the country’s wastewater will be treated (see also ‘Challenges’). The Chabrouh Dam, Lebanon. Photo: Joelle Comair. Litani River Authority website: http://www.litani.gov.lb/en/?page_id=91. Geara et al., 2010; Electricité du Liban. 2005. A ten-year plan was developed in 1999, renewed in 2009 and later updated and adopted as the National Water Sector Strategy in 2012. American University of Beirut Outlook. 2015; Al-Akhbar, 2013; Al-Nahar, 2013. Approved in September 2014 and funded by the World Bank. Currently, water is diverted away from Lake Qaraoun through a series of hydroelectric plants and tunnels and residual water is released into the Awali River before reaching the sea. The World Bank, 2014; CDR, 2014; MoE, 2011; Yamout and Jamali, 2007. Additional sources for this section: The World Bank, 2011; CDR, 2013d; Karam et al., 2013; Geara et al., 2010; L’Orient Le Jour, 2014a; MEW, personal communication, 2015.